Anyway, my main point is that if I want to garden organically, I must do so with my whole heart. And half of my heart is Jeremy's, so I had to convince him to let go of the sprayer. I'm trying not to speak badly of him, he has plenty of reasons to want to spray, mostly because the weeds always win. I've been pregnant or had a baby on my hip for a while now, and he's always working. We're getting a head start on the weeds this year though. At the least, we're trying another experiment. Because he's not convinced this is going to work. And maybe it won't, but this is what Quinn at Reformation Acres and Jill at The Prairie Homestead do, so maybe, maybe it will work. We dropped four, yes four, old round hay bales on our garden. The hay is so thick; it's at least 6 inches. And we had a blast spreading it out. We just unrolled it and pushed it all over, flipping it when we would come to a garden border. The kids loved it, and we loved watching them play. Afterwards, we did have to go shower right away, of course. Occasionally, I pull back the hay a little to see what's going on underneath. It looks awesome! Worms, bugs, and soil are looking back at me. It looks alive. So I'm going to let this hay sit on top of this dirt all winter, and we'll see what happens in the spring. I'm excited, and a little apprehensive. We'll bring over another bale or two come springtime to cover any weeds that may, and most likely will, start poking through. The weeds are dead to me. I'm burying them for good, and if I have to keep burying them, keep telling them I'm free and not beholding to them anymore, I will. And I just started thinking about sin. I'm telling you, the garden is one of the meeting places for God. (After all, He did put us there.) Sin is dead to us who claim Christ's gift of Grace. We cannot let it back into our lives, and that means replacing the sin with holiness. Amen! God is good. Hopefully, this hay is holy. Anyone else using hay to smother your weeds? PS I have Jeremy to thank for this little gem of a picture. I don't really think any of us needs to see that side of ourselves. Thank you so much for stopping by the Homestead Blog Hop!! So I'm curious! Did the hay work at smothering out the weeds? yes! Until it all decomposed, and I couldn't find anymore. For now, I'm desperate for more hay! 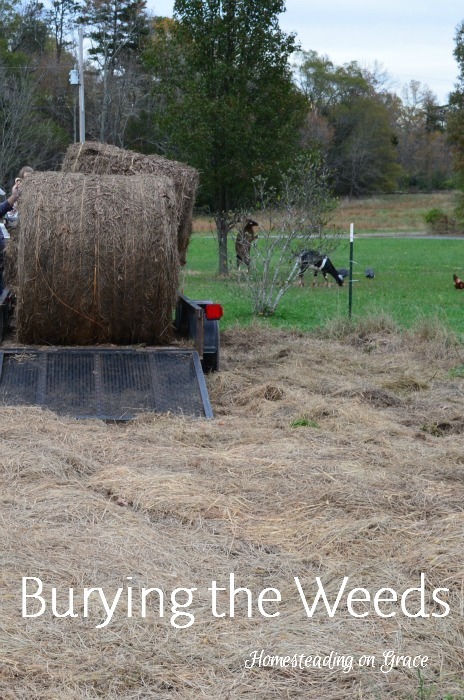 You can also use a thick layering of grass clippings instead of (or in combination with) hay.